The first of the two readings, i.e. Systolic Blood Pressure, is a measure of the pressure in the blood vessels when the heart contracts and exerts maximum pressure on the blood vessel walls while pushing the blood out. The second reading, i.e. Diastolic Blood Pressure, measures the pressure in the blood vessels when the heart is at rest, i.e. between contractions. The normal systolic blood pressure is considered to be 120 by most doctors, and the normal diastolic blood pressure is considered to be 80. Blood pressure normally increases throughout life, right from infancy to older adulthood. For most adults, regardless of their age, the normal BP range is considered to be 120/80 or less. What is the Normal BP Range For Adults? The normal BP for all adolescents, adults, and older adults is considered to be 120/80. Adolescents mean persons aged between ages 10 and 19. For this age group, the systolic blood pressure from 120 to 136, and the diastolic blood pressure between 82 to 86 is considered to be normal. The normal BP range may vary from 126/82 among adolescents aged 11 to 13, 136/86 among those aged between 14 to 16, and 120/85 for adolescents aged between 17 to 19. The difference in the normal blood pressure range for this age group is caused by the increase in age, and it also depends on the individual’s physical activity, diet and weight. As blood pressure increases with age, it is very common for adults aged between 20 and 60+ to show variations in BP at different ages. The chart below outlines the blood pressure that is considered normal in people belonging to different age groups. An adult is considered to have prehypertension if his/her systolic blood pressure is constantly above 120 but below 140, or if the diastolic blood pressure is above 80 and below 90. People with prehypertension will definitely progress to hypertension if they do not make lifestyle changes that will help lower their blood pressure. Smoking: Tobacco contains the hormone adrenaline that makes the heart beat faster and thus raises the blood pressure. Obesity: Being overweight increases the chances for a person to develop hypertension. High Salt Intake: Too much of sodium in the bloodstream causes higher water retention in the body and causes the blood pressure to increase. High Alcohol Intake: Heavy alcohol intake, especially on a daily basis, can be another cause for the blood pressure to increase. 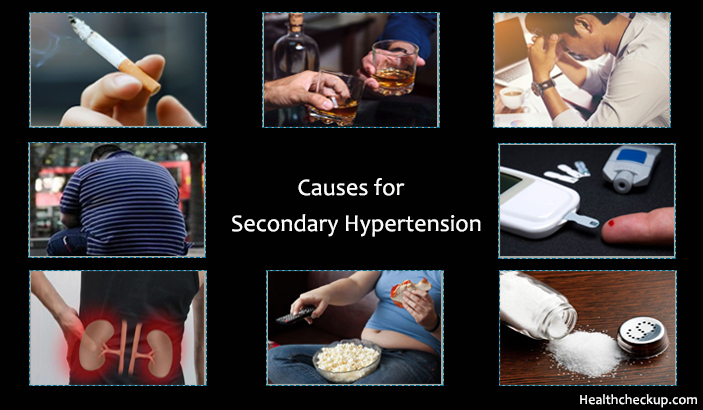 Inadequate Physical Activity: Lack of exercise and a sedentary lifestyle is a very common cause for secondary hypertension. Stress: Heavy emotional or mental stress can also cause the BP to rise. Diabetes: Type 2 diabetes usually causes the narrowing of the blood vessels in the body and causes high BP. Family History: A person with a family history of hypertension is more likely to develop hypertension than a person without any family history of hypertension. What is Normal Blood Pressure for Men and Women? The normal blood pressure range for men and women remains the same across all age groups. Normal BP Range for Female in India – Below 120/80 mm Hg and Above 90/60 mm Hg in an adult female. 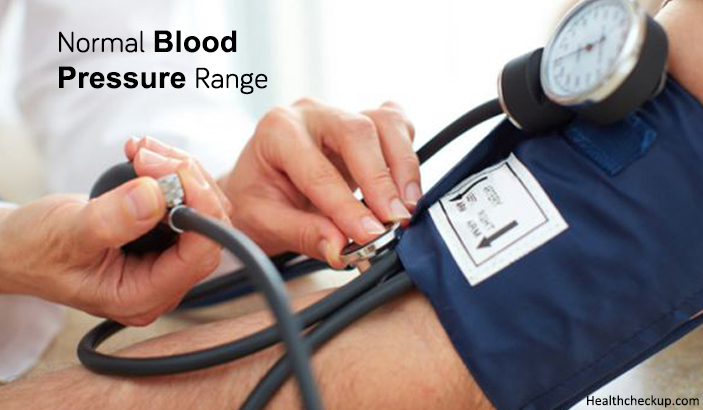 Normal BP Range for Male in India – Below 120/80 mm Hg and Above 90/60 mm Hg in an adult male. However, when it comes to hypertension, it is important to recognise the differences between the two genders. High BP is more common among men below the age of 50 than women of the same age, and the chances of developing hypertension increases in women as compared to men after the age of 55. These findings suggest that regular BP screening should be conducted for young and middle-aged men, once they enter the 20s, and the same applies to women who have passed the menopause stage. The normal bp range changes continuously for children throughout childhood, and the blood pressure is lowest in infancy and steadily increases till the child turns 10. Also, it is important to note that the normal BP is different for girls and boys belonging to the same age group. As mentioned earlier, it is least likely for children to suffer from blood pressure problems unless they have an underlying condition such as a kidney disease or diabetes, and therefore, doctors rarely check the BP in children during their regular checkups. How To Improve Kidney Function To Avoid Dialysis?